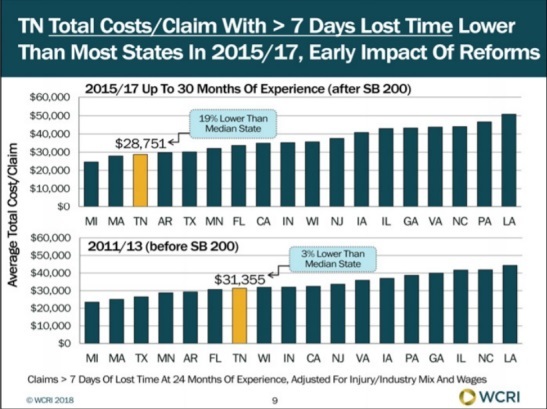 Cambridge, MA – The average total cost per workers’ compensation claim in Tennessee decreased 6 percent in 2015, reflecting in part the impact of reforms enacted in 2013, according to a recent Workers Compensation Research Institute (WCRI) study. “Most of the 6 percent decrease in the average total cost per workers’ compensation claim in Tennessee was from a 24 percent decrease in permanent partial disability (PPD) benefits. Total costs per claim incorporate payments for medical treatments, indemnity benefits, and expenses to manage claims,” said Ramona Tanabe, WCRI’s executive vice president and counsel. In 2013, Tennessee Senate Bill (SB) 200 introduced significant changes to the state’s workers’ compensation system, which impacted key cost components. The overall goals of the 2013 reforms in Tennessee were to create a workers’ compensation system that was more equitable, efficient, and easier to understand for all parties, as well as to help attract more employers to Tennessee. SB 200’s reforms went into effect for injuries incurred after July 1, 2014. The study, CompScope™ Benchmarks for Tennessee, 18th Edition, compared Tennessee with workers’ compensation systems in 17 other states and found the average total cost per workers’ compensation claim in Tennessee was lower than the median CompScope™ study state. WCRI’s study used claims data with injuries dating back to October 1, 2014, and payments made through March 31, 2017. “Senate Bill 200 changed several aspects of Tennessee workers’ compensation law. These changes included a revised definition of injury, adoption of an administrative system for resolving disputes, revisions to the method for calculating PPD benefits, new medical treatment guidelines, and many other provisions,” said Tanabe. Worker attorney involvement has decreased in recent years, likely related to SB 200’s multiple reform provisions. Time to first indemnity payment within 21 days of injury in Tennessee was similar to other WCRI CompScope™ study states in 2016/2017. For more information or to purchase a copy, click here: WCRI: CompScope™ Benchmarks for Tennessee, 18th Edition .